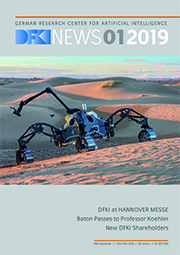 The DFKI competence center Smart Agriculture Technologies (CC-SaAT) synergizes the competences of the German Research Center for Artificial Intelligence in the field of agriculture. As a primarily application-oriented competence center, CC-SaAT brings together different agricultural technologies developed at DFKI. For that purpose, it can rely on the collective expertise of the world’s largest research center for artificial intelligence. The area of application considers agriculture in a broad sense and covers a wide range of topics, including arable and livestock farming, horticulture, forestry, viticulture and fishery. Together with industrial partners and other research institutes, CC-SaAT develops and applies innovative AI technologies in these fields. It is the central point of contact for partners from industry and research, and coordinates the corresponding activities within DFKI in these fields of application. CC-SaAT is financed by national and European research projects as well as industrial projects. Our business activities – targeted towards regional mid-sized companies up to global industry leaders, organizations and stakeholders – include the individual development of intelligent software solutions, technology transfer of internationally awarded research results, innovation consulting, scientific support, market surveys and feasibility studies.